Assessment of source-code qualities, such as correctness and maintainability, and test-suite qualities, such as coverage. Piloting quality-assessment processes with potential customers. Software development. Developer in a small Scrum team, working on the LabCONN2 system. LabCONN2 facilitates data exchange between surgeries and laboratories. I originally started as the team's Product Owner, but switched roles with a teammate when I participated in a student exchange. I worked on an Application Designer used to create web-based interfaces for Service-Oriented Architectures. I participated in the development of new features, maintenance, and customer service. I'm the project lead of MuBench and MuDetect. My work is partly funded by the IT-Project-Leadership Program "Software Campus". I'm a member of the program committees of the MSR'17 Mining Challenge and SANER'17. MuBench is an automated benchmarking pipeline for API-misuse detectors, such as MuDetect, GrouMiner, JADET, Tikanga, or DMMC. MuDetect is an automated static detector for API misuses. A user-interaction tracker and intelligent code completion for VisualStudio/C#. I'm a core committer to this project, almost from day one. In der heutigen Softwareentwicklung ist der Einsatz externer Bibliotheken kaum mehr wegzudenken. Leider sind die Schnittstellen (APIs) dieser Bibliotheken nicht immer intuitiv und ausreichend dokumentiert. Daher kommt es immer wieder zu Fehlern, weil Entwickler eine API anders verwendet haben als es der API-Entwickler vorgesehen hat. Solche Fehler werden auch "API Misuses" genannt. Ein klassisches Beispiel für einen API Misuse ist, wenn ein weiteres Element aus einem Iterator abgerufen wird ohne vorher zu überprüfen, dass ein weiteres Element existiert. [Eine Studie][misuse] hat gezeigt, dass API Misuses sowohl während der Entwicklung als auch in Releases immer wieder Probleme bereiten und in 7 von 10 Fällen Programmabstürze verursachen. I use Docker to provide a platform-independent, ready-to-use environment for my research prototypes. Reduce setup time, faster CI, and did I say platform-independent? I try to make using my (test) code as easy as possible. Makes it more likely people actually use it! Implicit assumptions may cause much confusion and miscommunication. Conversely, sometimes, it’s making them explicit what helps others the most when we try to explain something, be it in a talk, a lecture, a discussion, or in a scientific publication. Recently, I received an email from a former student assistant of mine, who observed that I name tests different today, compared to when we were working together some years ago. He was curious to learn what guidelines I’m following now and what led me to them. Let me try to recap. Where does legacy code come from? What is legacy code, anyway? Why should we care about it? Can we make it go away? How? Can we prevent it from coming back, or even from ever showing up in the first place? Most people cannot construct a building or write a book, yet, it seems like everybody can program. Isn't that peculiar? I recently stumbled upon a great talk by Martin Flower about Technical Debt. In the talk, he first classifies technical debt according to whether you are aware of taking it up (deliberate) or not (inadvertent). Then he also classifies it according to whether you do so as the result of an informed decision (prudent) or because you donвЂ™t care (reckless). From these two dimensions Martin forms a classification, separating four categories of technical debt. I'm bad with names. Sometimes, when somebody tells me his name, I catch myself having forgotten about it literally in the next sentence. I've tried some techniques to prevent this from happening - such as immediately repeating the name several times in my head or using phrases like "Nice to meet you, NAME" to repeat them out loud. These help, but I still find it difficult. Research is agile. Not only in its software development, but in its entirety. Simply because one rarely knows where it's going next. Research is, by its very definition, explorative. You have a problem, come up with possible solutions, implement the best, evaluate it, and either continue or backtrack. Adapt to change (new insights). Improve iteratively. Early in my PhD, attending my first conference, in fact, I stated that I usually don't work on weekends and public holidays. Several jaws dropped. "How do you ever want to finish your PhD?," I was asked. A strong set of tests gives me confidence that the tools I devise do what I want them to do and that my experiments test what I intend them to test. This is crucial to my research. If I wouldn't have this confidence, how could I publish the results of my experiments, claiming that I found a better solution to the problem I'm working on? As you might remember, academics code, too. And that's not even only computer scientists: The first of my friends who needed to program in university were physicists. Early on, they had to evaluate the results of their lab experiments, which produced considerable amounts of output. Too much, certainly, for any sane human to process. And since respective software was simply unaffordable, they would go a write their evaluation scripts themselves. Of course, most of them were self-taught amateurs at the time. They didn't have any courses about programming, testing, design, or even version control. In early 2014, Cope published an article titled "Why Most Unit Testing Is Waste" and little later a follow up. In these articles, Cope states that unit testing, i.e., testing of individual functions, targets the wrong level of granularity for object-oriented software and will only every cover a very small subset of the actual state space, therefore, finding only few bugs. Worse, splitting functions solely for the sake of testability destroys the design. Tests (or test coverage) should never become a primary goal. 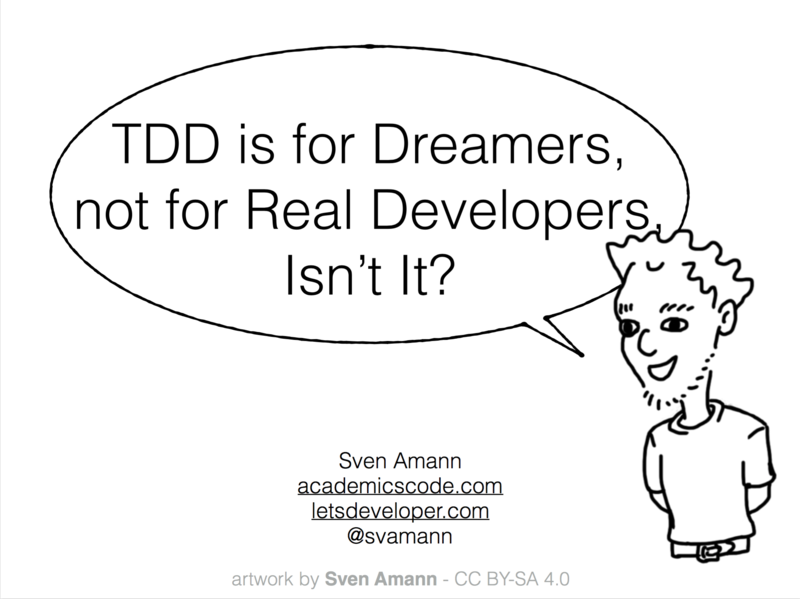 In 2007, Robert C. Martin (Uncle Bob) and James O. Coplien (Cope) had a discussion about TDD at the JAOO Conference. Uncle Bob opened the discussion proclaiming that it has become infeasible for a professional developer not to practice TDD. Cope, on the other hand, states that he has adopted a very strong position against what, in particular, the XP community calls TDD and absolutely rejects Uncle Bob's thesis. I'm an academic. I've never had a full-time developer job in my life. Yet, I write and screencast about software development. Why the heck should you care to listen to me? When I recently set up a Travis build for my website, I came across several sources mentioning automated testing of Jekyll pages. Of course that got me curious. After all, what's CI without test? Part of what I ended up adding to my site's build is from an article by Jacob Tomlinson. I'll repeat those parts that I found useful and add my additional insights while I go along. A while ago, I moved my website and blog to Jekyll. Good decision. No more Wordpress vulnerabilities, less bling bling, more control. Only drawback: I can no longer blog from my tablet. Well... I couldn't. Here comes my first Jekyll post from my iPad. Last week, I had the chance to sharpen my “Intercultural Awareness” in a 2-day training, organized by SAP and Software Campus. Our coach was Melissa Lamson, who made the training an awesome experience, as she happily shared her knowledge and experience with us. Discusses how test-first development and test-driven development are founded in the queuing theory. Good read on why you shouldn't work over hours and why becoming more productive is about doing less. Oct 2010 → Jan 2017 Software Developer – Laborgenossenschaft Darmstadt e.G. Written 21 answers. Active in java.